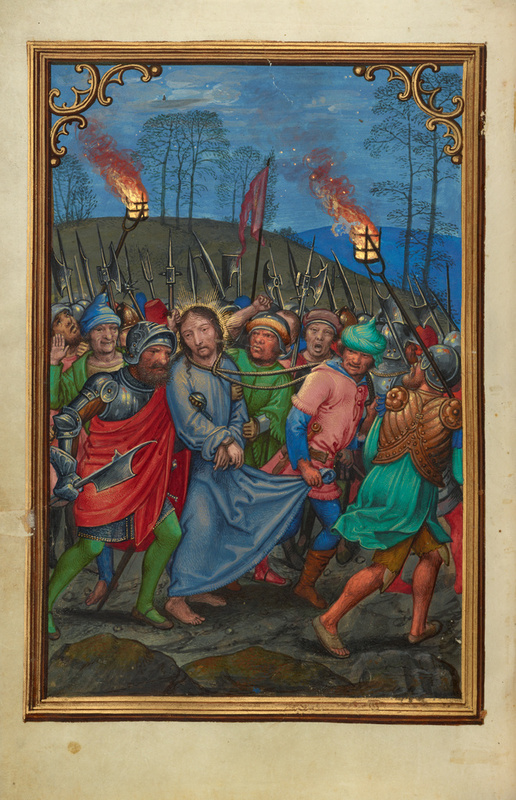 An armed mob leads Christ away with his hands bound and a rope around his neck. The torches carried by the crowd burn strong, leaving streams of smoke that trail off to the left, reinforcing the vigorous sense of movement to the right. Although moving to the right, Christ turns his head, present his face to the beholder for contemplation. A man with a wide-open mouth in the background looks directly out of the painting, which further engages the beholder. Simon Bening adapted this composition from an engraving by the German artist Martin Schongauer.